hoytech github Most of my current open-source programming can be seen on github. Perl modules I've uploaded a bunch of perl modules to CPAN. Antiweb webserver My webserver program. There is also a historical site for awhttpd, Antiweb's predecessor. vmtouch The Virtual Memory Toucher: Portable file system cache diagnostics and control. Network Universal Frame Forge A Scheme-based programming environment designed for network security research. Haskell Software Programs and modules I've written in Haskell. Hoyte BlackJack Labs Analysis of the casino game of BlackJack. TI-83+ Software Software for the TI-83+ graphing calculators. Frugal Forth HCSW's implementation of the Forth programming language. Let Over Lambda My book about programming macros in Common Lisp. ircgames.tar.gz Multiplayer IRC games written in C. Two games currently included: 6-deck, H17 casino blackjack (currently no splitting) and no-limit texas holdem poker. isaac.lisp An optimised Common Lisp implementation of Bob Jenkins' fast cryptogaphic pseudo-random number generator ISAAC. HCSW's Ident Daemon A simple daemon for faking ident replies to IRC servers. Natively supports IPv6. unix2inet-bridge.c This utility allows you to bridge sockets in the AF_UNIX domain to regular AF_INET internet sockets so you can run Nmap scans on them. Also useful as a general purpose cross-family bridging program. lightning-forth.c An unfinished cross-platform forth kernel using the GNU lightning just-in-time (JIT) assembler. If I ever get around to finishing it this will be a highly portable directly-threaded forth kernel that should perform better than pure C kernels on most architectures. compile-shape.lisp A Common Lisp program that defines a Domain Specific Language for the representation of regular polyhedra. 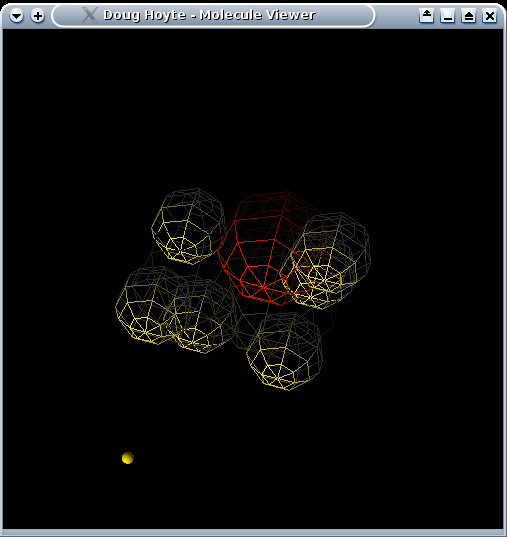 It includes a compiler to convert them to their cartesian coordinate representation suitable for plotting and a handy function for interactively displaying information on polyhedra. Polyhedra currently included: cube, icosahedron, dodecahedron, cuboctahedron, truncated-hexahedron, truncated-octahedron, and infinite classes of prisms, anti-prisms, pyramids, and bi-pyramids. portcompress.c A program that allows long lists of port numbers to be encoded into a fairly efficient ASCII-armoured run-length encoded transport medium for efficient storage and convenient interchange. 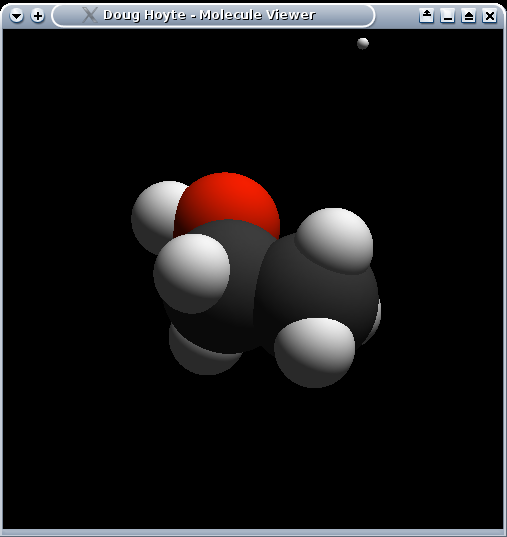 molview.lisp A molecule viewer program written in Common Lisp using the OpenGL libraries. Very pretty looking, interactive, and lots of neat features (try the random-walk framerate testing mode). See these screenshots. dvonn.tar.gz A text interface and AI for the DVONN board game written in Common Lisp. Compilation and usage instructions can be found in the README. See my blog entry for more details. convex A flexible pattern matching system designed for creating response driven IRC bots. Requires you to get very close to the IRC protocol layer: Good for experienced IRC users/programmers who want a quick and dirty IRC solution. pfact.c A simple MPI program to search for integer factors in a large number. Will run on N distributed CPUs. mmult.c A simple MPI program to multiply matrices in parallel. Will run on N distributed CPUs. jumble.lisp and jumble.txt A lisp program that explores the word conflicts that can occur by jumbling internal letters inside a word while leaving the first and last letters fixed. More information can be found here. armour.c A pair of functions for encoding/decoding binary data into a safe ASCII transport medium. Similar to base64, but smaller code. fact.c An inefficient but simple C program for finding arbitrary precision factorials. ircmask.c Some useful functions for comparing irc masks. coinflip A cryptographically secure server/client program and protocol for choosing random bits that 2 parties who don't trust each other can both agree are random. Detailed protocol description in README. numerical palindrome search program. A program for searching for numerical palindromes. See here for a screenshot. brainkey A little program that will flash your capslock key in linux. Intended to relax or stimulate your subconscious mind. Uses blinkd. Also see Brainstar. Nmap Patches I have written code for numerous parts of the Nmap Security Scanner (as well as some patches that aren't included). eth sports betting Wrote some code for this site.